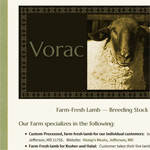 www.voracsuffolks.com/ New site and identity. Nothing says “I don’t care” more than a site that has dead links. Download this free tool to keep your site’s external links up to date! ©2019 Upcounty Web Sites. All rights reserved.